Lancashire based security specialists, Keyways can provide comprehensive security systems including CCTV systems that will effectively protect you and your business. "The Eye That Never Blinks"
CCTV cameras act as a major deterrent to criminals as they have to disguise themselves as well as contend with the crime. In more recent years the quality of CCTV recordings has greatly increased, this is due strongly to the use of digital technology, allowing better quality pictures at a dramatically reduced cost. This has allowed the CCTV systems to be installed in a variety of properties, ranging from high risk businesses right through to domestic homes. A small domestic CCTV security system will allow you to view around your property from your home television as well as being able to look over past recordings from previous days from your computer. You can even access the system from all over the word using an internet connect or smart phone! Cameras can be discreetly located with the minimum of impact to the exterior aesthetics of your building. At Keyways, Lancashire we can also install monochrome CCTV cameras that can provide the very best recordings at any point as is possible. 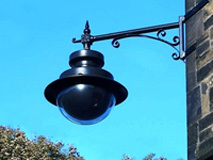 Monochrome cameras are far more sensitive than standard CCTV cameras and can provide good quality colour during daylight hours that becomes monochrome at night. Furthermore monochrome cameras can be sensitive to infrared light so they can see in total darkness.